The new chainsaw has served you long, and get from it only positive emotions, you need to try it. 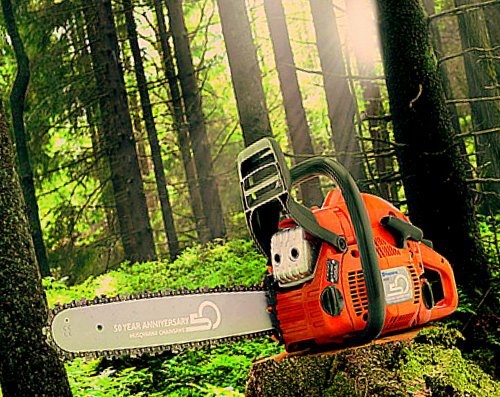 In the process of running-in there is different parts of the engine and saw the headset, thereby increasing the life of the chainsaw and the stability of its work. The manual for your chainsaw. Pay special attention to the sections on the cold start and hot engine. Starting the engine is the same in all gasoline-powered saws. Differs only in the location of the bodies of management. Install and adjust the saw headset. Prepare fuel mixture, keeping the exact proportion of gasoline and oil (see passport chainsaw). For two-stroke engines, a ratio of 1:50, i.e. 20 g of butter 1 liter of gasoline. The first dressing is allowed to add 25 g of oil per litre of petrol, in the first hours of operation mechanisms of the engine has received heavy grease. Pour the finished mixture into the fuel tank. Check if there is oil in the tank from which the lubricated chain. The lack of lubrication when running on high speeds, will damage the chain and the saw blade. Before starting the test, in what position is the inertial brake. When it's off, the chain can be freely rotate by hand. Do not operate when the inertia brake is engaged. This can lead to melting of the saw body and fire. Start the chainsaw and let it run it 5 minutes. Then start cutting branches and small trunks (up to 100 mm). Saw should run at medium speed. Observe safety precautions! 40-50 minutes of operation, check the chain tension, if necessary, retighten it. Will continue to run (until you run out of fuel in the tank). Avoid prolonged operation of the saw at idle! Do not overload the engine of the chainsaw when running. Avoid actions which can cause binding of the chain or engine stop. This will lead to the failure of the new engine and damage to the saw. Is not the case the warranty will have to be repaired at his own expense. After completing the run, take the chainsaw to a service center. Specialists of the center perform control tuning of the carb. Then you can use his chainsaw, observing the operating instructions and safety precautions. Do not run the chain saw without the saw headset! Visit the service center 2 times a year for prevention. To buy oil treat carefully. On the label of the canister should be specified that it is for chainsaws, not for boats or mopeds.